This program was curated in participation with the College Art Association’s ARTspace Media Lounge project. Virtual Corps grew out of an exquisite corpse approach, focusing on the relationships that develop between the works as one transitions into the next. The chosen works are varied explorations of the virtual which, when examined sequentially, reveal converging meanings. We begin by considering self-exploration at its most primal; recognizing one's body and its consequence in space. Movement in place is considered both in the traditional sense of virtual reality, as well as in the stasis of the mise-en-scène that foregrounds a webcam. These acts and performances in confined private spaces have broader implications that resonate in an exterior space, perhaps not physically, but virtually. In some cases, these movements take on symbolic effect as gestures that speak to one's cultural, political, and geographic context, and we begin to see how these contexts profoundly influence how we move. The reiteration of popular culture through private quotidian performances calls into question what inspires us to perform, communicate and share with the virtual community, in a way that is specific to its anonymous atmosphere. The works explore the hinterland between the act of defining one's individualism within the globally expansive culture industry, and recognizing that we are also products of it. The subjects seek self-discovery while mediating what it means to be both the same and different from the world outside of us, endeavoring to connect and communicate however remote and faceless their audience may be. 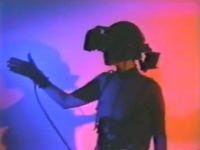 The tropes of the garden, the originary moment of self knowledge and gendered awareness of the body (what is traditionally called sin) is mimicked in the early experiments with virtual reality. The metaphors used in our cutting edge future are restagings of our cultural memory of the garden. Wonderment regarding the self in space, boundaries of the body at the edge of consciousness and the inside and outside skin of perceptual knowledge. What started out as a simple passion for dance for a young Iranian immigrant growing up in Germany, has since turned into a project of meditative retrospect and searching. My friend Navid, who accompanied me in the original video of 1991, continued on with his brother Omid to form a Persian pop star duo. Years later and two countries in between, I also turned to dance again. Though on a different path: running in trail and repetition of the dance move of passed childhood days - the Running Man. You can follow me over time to different locations as I stand still, in flow, and back in time with the aimless rotating steps of an ongoing journey. Around the World: Free Styling is the first episode in a series that explores universal human themes- what makes us different and what makes us the same. Curious about the widespread use of webcams, I investigated video blogs often made by teens who record themselves in all possible situations and present it online to an unknown public. Inspired by the real characters I encountered, I created the figures Anton and Lenny, who meet within the world of the Internet. I decided to abandon them to both a virtual and an urban reality and force them to confront their web existence within the real public space. Anton wanders through the big city, wondering whether his virtual meeting with Lenny has a place in the real world. How would they communicate and what does it mean to face someone virtually? Peggy Ahwesh’s work combines a variety of genres, utilizing improvisational performance, found footage, noise and a variety of obsolete, low end technologies. Primarily an investigation of cultural identity and the role of the female subject, humor and the absurd are employed in an open embrace of the inexplicable. She came of age in the 1970’s in Pittsburgh with S8mm amateur filmmaking, feminism and the punk underground. Her film and video work is distributed by EAI, New York and Lightcone, Paris. Mirak Jamal is a multi-disciplinary artist that currently resides in Berlin. He grew up between Iran, the Soviet Union, Germany, the U.S., and Canada. 12 introduced to the "other"
18 introduced to keeping ones head above water. Red Bucket Films is born. 23 exploring and working with even more fervor and excitement. Born 1974 in Chicago, Illinois, Amie Siegel lives and works in Berlin, New York and Cambridge, MA. She received her BA from Bard College and MFA from The School of the Art Institute of Chicago. Exhibitions include The Talent Show, Walker Art Center, Minneapolis; Another Point of View, La Galerie, Noisy-le-Sec; The Russian Linesman, The Hayward Gallery, London; 2008 Whitney Biennial, Whitney Museum of American Art, New York; Forum Expanded, KW Institute for Contemporary Art, Berlin. Screenings include the Museum of Modern Art, NY; Berlin International Film Festival; Pacific Film Archive, Berkeley; Harvard Film Archive; BFI Southbank; Museum of Fine Arts Boston, Andy Warhol Museum, Frankfurt Film Museum and Film Forum in New York. Her first book of poetry, The Waking Life (North Atlantic Books, Berkeley, CA) was published in 1999. She teaches in the Department of Visual and Environmental Studies at Harvard University. She has been an artist in residence of the DAAD Berliner-Künstlerprogramm and is a recipient of the Guggenheim Fellowship. Cyril Amon Schaublin (b. 1984) grew up in Zurich, Switzerland. He studied Mandarin Chinese, Art History and Ethnology at the University of Zurich and Beijing Film Academy, China. Currently, he studies film directing at the German Film Academy Berlin (dffb). He attended the Berlinale Talent Campus 2010 and his work has been screened at numerous international film festivals including the Festival Du Nouveau Cinéma Montréal, the Torino Film Festival and the Viennale.